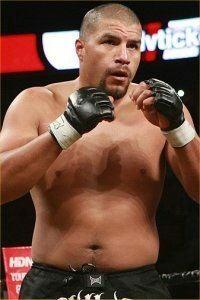 Hector “Sick Dog” Ramirez (10-6-1) is a UFC and Bellator MMA Veteran. Injuries have prevented Ramirez from competing since his last fight in 2013, but “Sick Dog” is looking to make a comeback and the man on his radar is none other than “The Huntington Beach Bad Boy” Tito Ortiz. We caught up with Hector Ramirez to get a better understanding of why he wants this fight. MyMMANews – I understand you have a lot to say and there is even a certain fighter that you want to call out but first, let’s talk about you and what you have been up to. You last fought in November 2013 at Bellator 106. What has been going on during that two and a half year that has kept you from competing in mixed martial arts? MyMMANews – Did something happen between you and Tito Ortiz? Is there a specific reason before reason besides just the tickets sales that you think this would be a great fight? Is there a beef between you and Tito? MyMMANews – Realistically, Tito is coming off a title fight loss. He challenged Liam McGeary for the title. You are coming off a loss in 2013 so like you said the matchup probably won’t happen right away. Are you still currently under contract to Bellator? MyMMANews – You just turned 40 years old, earlier this year. Like you said, you don’t know if you have a contract with Bellator or if you have to go to another agency or what. How long do you see yourself actively competing in mixed martial arts? MyMMANews – Speaking of the injury, and like you said, you wanted to make sure you comeback at 100 percent, are you at 100 percent right now? WHICH FIGHT WOULD YOU DO AGAIN? MyMMANews – You’ve had one heck of a career. You have fought a number of guys who have went on to win world titles; Forrest Griffin, Rashad Evans, Emanuel Newton, Brandon Halsey. Is there any one of those fights that if given a second opportunity you would like to take another shot at? MyMMANews – You can never do MMA math saying ‘This guy can beat this guy, because they beat this guy,’ because it just never works out that way. But like you said, you have the loss to Forrest, but Forrest has a win over Tito, so say you and Tito do actually get paired up in a fight in Bellator, how would you train for that fight, would you watch to see how Forrest defeated Tito, or how do you gameplan to beat with Tito Ortiz? MyMMANews – Before we let you go is there any sponsors you want to thank or any place you want fans to follow you on social media? The floor is yours.